Can I Substitute Ground Cinnamon for Cinnamon Sticks? Ground cinnamon and cinnamon sticks are cut from the same cloth -- or rather, from the bark of the same tree. Ground cinnamon is made from cinnamon sticks that are broken down until they form powder. Both versions of the versatile spice have the same flavor, so it sometimes works to substitute ground cinnamon for cinnamon sticks. This substitution certainly doesn't change the flavor of a recipe; however, the difference between cinnamon sticks and ground cinnamon powder may change the texture or the visual presentation of a dish. A cake or pudding recipe that calls for cinnamon sticks usually showcases the intact stick in addition to incorporating its flavor. Recipes for baked goods that use cinnamon sticks tend to rely on them for added visual appeal. When serving, though, the whole sticks are a bit awkward on top of a cake or crisp, and they are usually removed before the dessert is consumed. Substituting ground cinnamon for cinnamon sticks in a cake or pudding will provide cinnamon flavor, but it won't look the same. Brewed drinks such as mulled cider and chai often use whole cinnamon sticks to infuse flavor, although these sticks are typically strained out before the drink is served. It's not a good idea to substitute ground cinnamon for cinnamon sticks in this type of drink recipe because the powder makes the drink gritty and is too fine to strain out with a typical mesh strainer. Cinnamon sticks can be added to savory marinades, adding flavor that works especially well with curries. Cinnamon powder can be used as a substitute, although it should be whisked in thoroughly to avoid clumps. 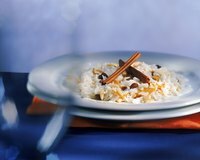 Cinnamon sticks are also used in rice dishes such as Indian, Iranian and Afghani pilafs. Substituting ground cinnamon in these dishes will provide the same flavor but the dish will lack the visual appeal that the whole sticks provide. You can easily substitute ground cinnamon for cinnamon sticks in stews, where the spice will cook long and slow, and fully dissolve. Use one-half to one teaspoon of ground cinnamon in place of one cinnamon stick in recipes where it is appropriate to substitute. Add half of the ground cinnamon, taste, and then add more if the cinnamon flavor is not overpowering.